Wed May 23 - general, Diagnostic Tape e-mails, Sat May 26 - 4th Sat. Allen Palmer wants the record to show that he was *not* off rocketing as rumored last week but that he was on the island of Kauai, Hawaii tanning his tummy - and was eager to raise his shirt to all unbelievers. Allen did some detail work re-assembling a PROLAY. 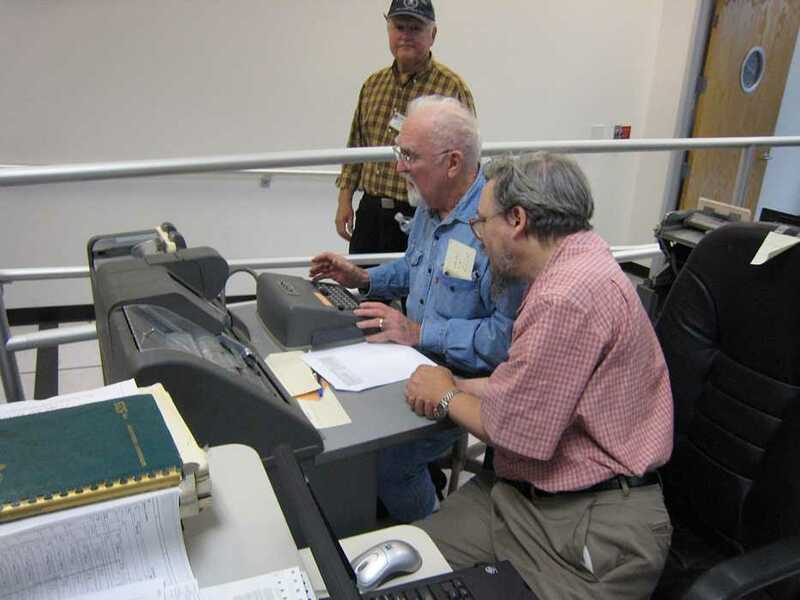 Joe Preston decided it was time to turn on the "new" 026 keypunch from Illinois. After about 5 minutes of slowly ramping up the voltage, we were at 100% rated voltage and the electrolytic capacitor was still cool and happy. We disconnected the Variac, connected the motor, plugged the 026 into the building AC, and turned on the switch. 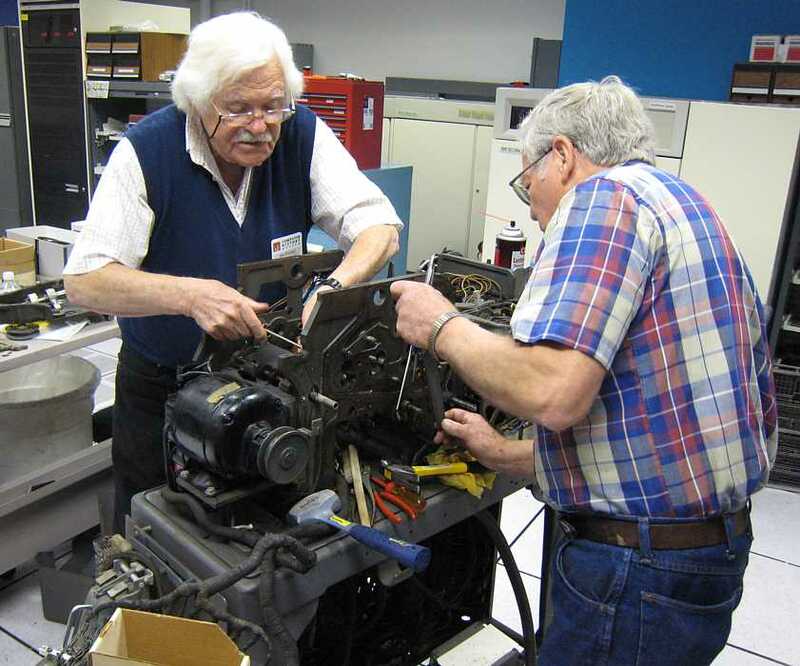 The motor went around just fine, but we noticed the friction clutch slipping (the gears that should go round and round were going back and forth about 20 degrees) and the trouble shooting began. 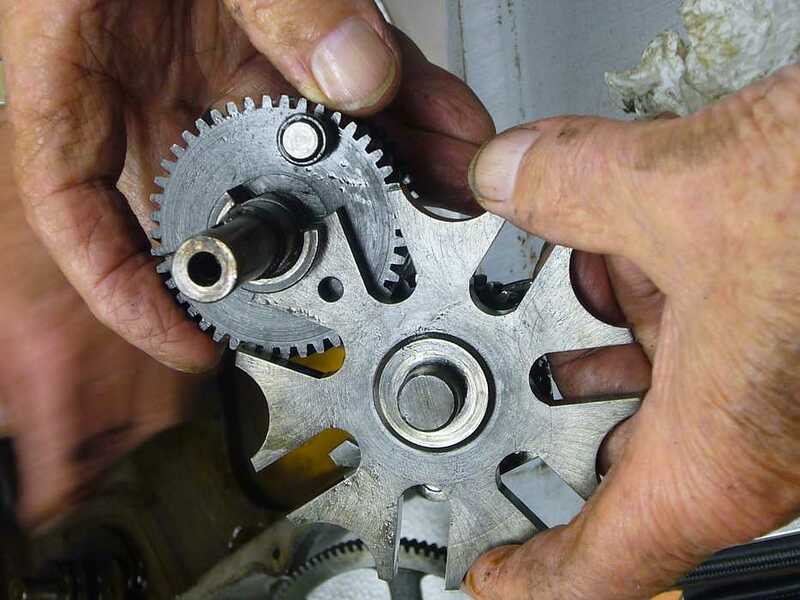 The manual (yes we read 'em ;-)) said that IBM # 22 grease is needed in the clutch area. Frank King remembered that # 22 grease is a silicone grease. "Pep Boys" said they have silicone grease - Joe says that he will get the correct stuff. - A solid bug involving a clear storage operation when crossing 8,000 character boundary. It will make the next op code disappear - like resetting ALL the bits in the opcode even the check bit. 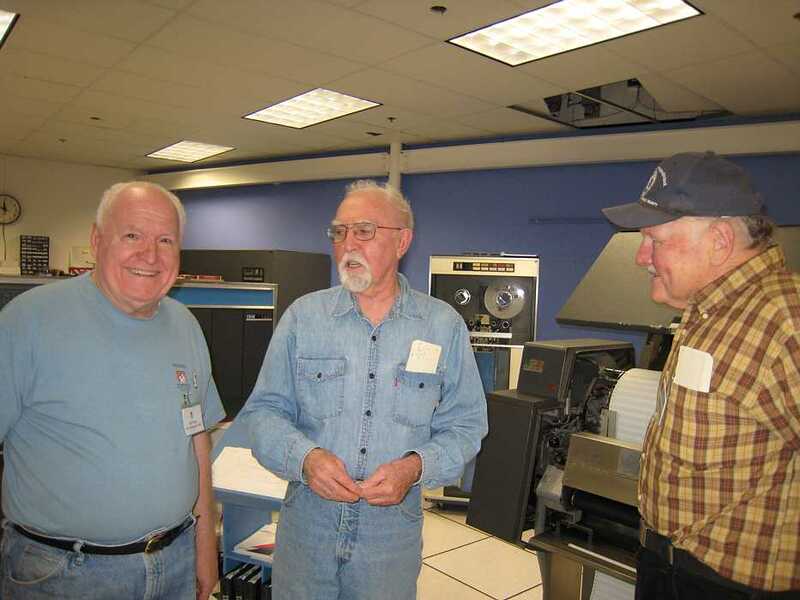 Frank King and Ed Thelen talked with Dag Spicer and Al Kossow about their trip to Portland, OR to see some IBM equipment. Dag showed us a list of equipment that CHM is likely interested in. 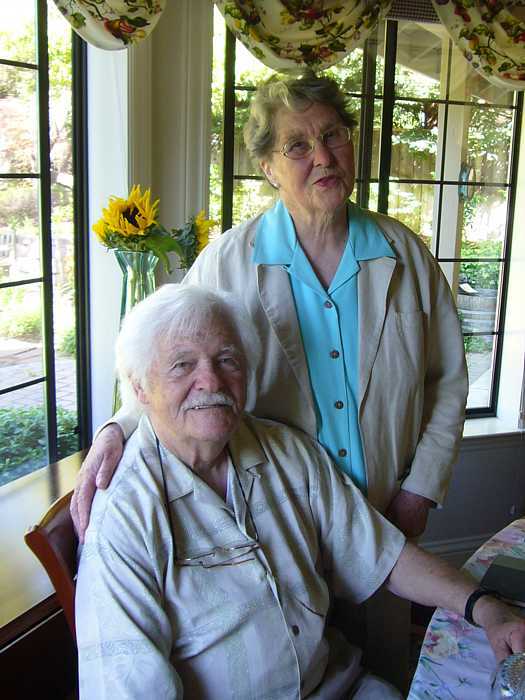 Frank mentioned that many boxes were so buried and otherwise inaccessible that he could not examine their contents. Possibly during a move operation, he could permit a more complete evaluation of many of these boxes - which might be useful documents or items. - useful for spares for the above. This will be discussed/incorporated into a list for possible truck trip by CHM to Portland. - The 20 drawer card files. I think the museum should get the 407 and the 519 because it is my opinion that both of those machines are restorable. My personal opinion is that we should look for a 402 or 403 to restore rather than a 407. But, we would still need a summary punch and that 519 looks as good as I have seen. Also as long as the 1401 is running we will always have a need to reproduce card decks. This is just my opinion and I would like to hear from the other guys who will have to do the work. I will have some time tonight and tomorrow to respond to questions about the condition of the equipment etc.. Thanks, for your involvement and help in this. I agree with Frank on the 082,083 etc on the list. But even more important is the 407/402/403/519 because I believe that we have the skills to restore them. 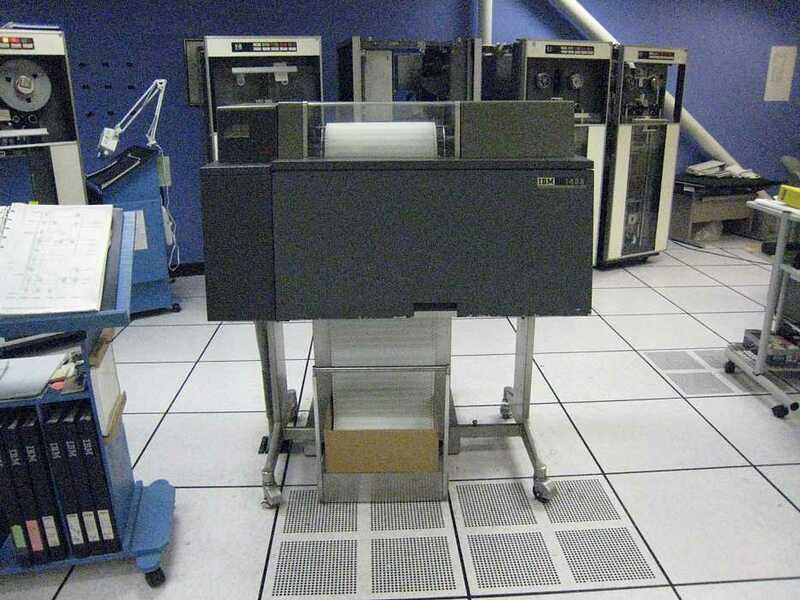 The 519 would be great to have to reproduce card decks and also to complete the 1950-1960 computer display room, the same reasons for the 402/3. I also suggest the we strip any equipment for parts that is not really worth the cost to ship or that the museum already has & does not want an extra machine. I would strip down to the frame if the parts were worth it. Just my thoughts. But the more 1950/60’s equipment that we restore the better. Present were Ron Williams, Bob Erickson, Frank King, Chuck Kantmann, Joe Preston, Robert Garner, Ed Thelen. Allen Palmer made the scene briefly - but left after a tense cell phone call. Ron didn't particularly disagree - and we have also gotten some ribbons from e-bay. 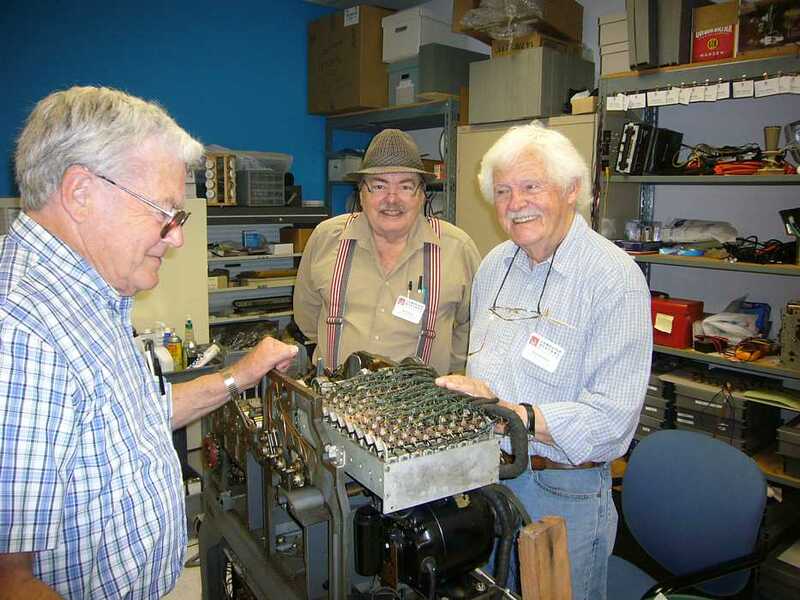 Frank King helped Bob Erickson remove the gear case from the 513 reproducing punch (which we are "evaluating". In any case we are having an "interesting" time. So we had high hopes for the internals of the gear case - inspite of the fact that there was no oil to be drained from the gear box :-| like it had about 1/8 inches of oil, the drain pipe stuck up 1/8 inch into the gear box. Bob Erickson said removing the gear box would take about 2 hours. I couldn't believe it would take that long, but tried to be agreeable. Ah - Off at last !! Frank says he can make another gasket - Not enough oil on this shaft bearing This spur gear bearing was damaged during removal, and also was dry. This spur gear had sharp teeth, wear??? And here is the famous Geneva Gear - responsible for starting and stopping each card 12 times so that it is stopped completely for punching each row. Note there are seven "teeth" on the Geneva Gear. Bob says that the gear goes around twice per card - with two of the 14 tooth cycles in the gap between cards. There is a 2 to 1 gear to provide a card complete signal to the mechanical logic. 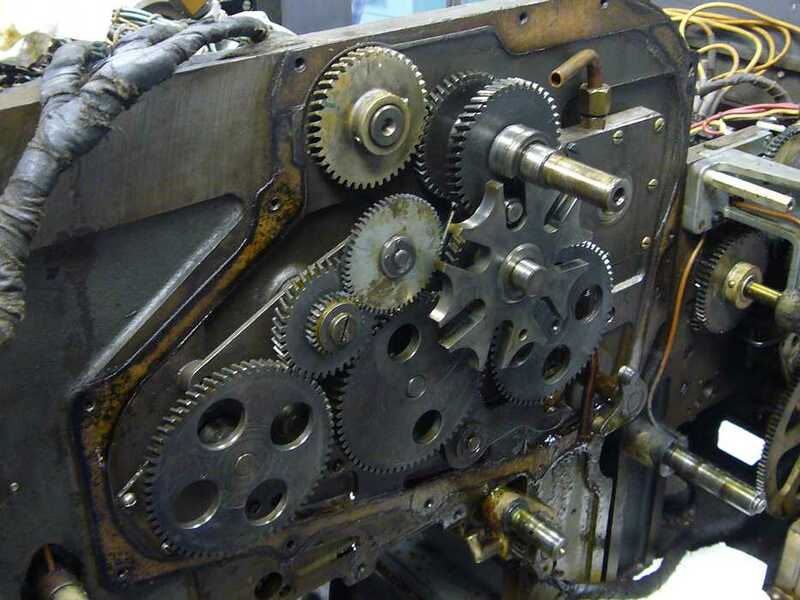 The spring and little parts in the middle are some kind of clutch mechanism, connected from a solenoid and mechanism on the outside of the gear box. Note the scoring/wear on the shaft at the top center. Not enough oil? and even get the mechanical timing right !! Ah for modern electronic stuff - now you just go to Fry's and get something that plugs and plays. No oil, no fuss, no muss, and if it breaks you just throw it out - 'tain't worth fixing!! Frank King and Ed Thelen met with Dag Spicer and Alex Bochannek for about 10 minutes to verify the list of material of interest in Portland, OR. Ron Williams continued struggling with the memory access problem that a program in lower 4,000 characters has accessing the upper 8,000 characters - see May 2 above. A large wired OR, including some overlap logic, floats too high above -12 volts. The wired OR involves a series of emitter followers - can't figure if insufficient drive or some load like a shorted base - a puzzle. Ron Williams brought in some "home work" - logic that would seem to be necessary to correctly support the hand drawn change in the schematic - to get the circuit levels correct. But the drawing supplied with the machine shows only this - which Ron says give wrong signal levels, U levels vs T levels. Bob Erickson checked the 1406, and indeed there is more logic hand wired in than shown on the diagram to the left. Grant has a plan for making test fixtures for our SMS cards. Start simple, make a specific fixture which tests most of the Trigger/ FlipFlop/ Latch cards. These are in the card families CW and JZ. High & low voltage, hot & cold temperature margining would be included. 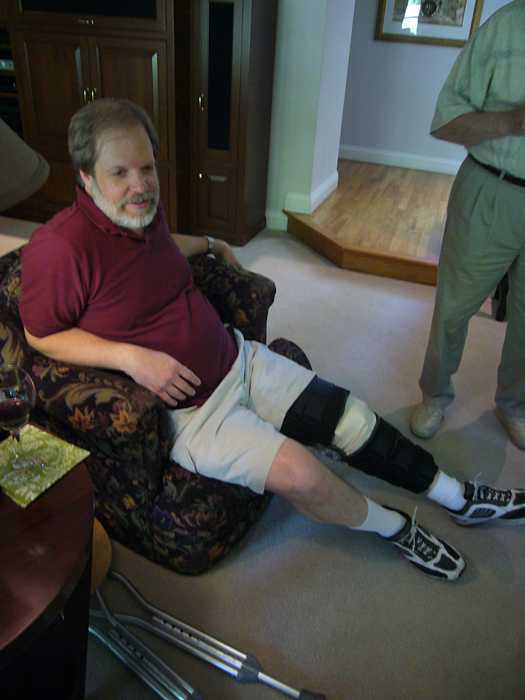 Ed Thelen started key punching Dan McInnis' Demo Assurance Program. Too many minutes later he had two (of 13) cards that seemed to match the listing. This is NO FUN. 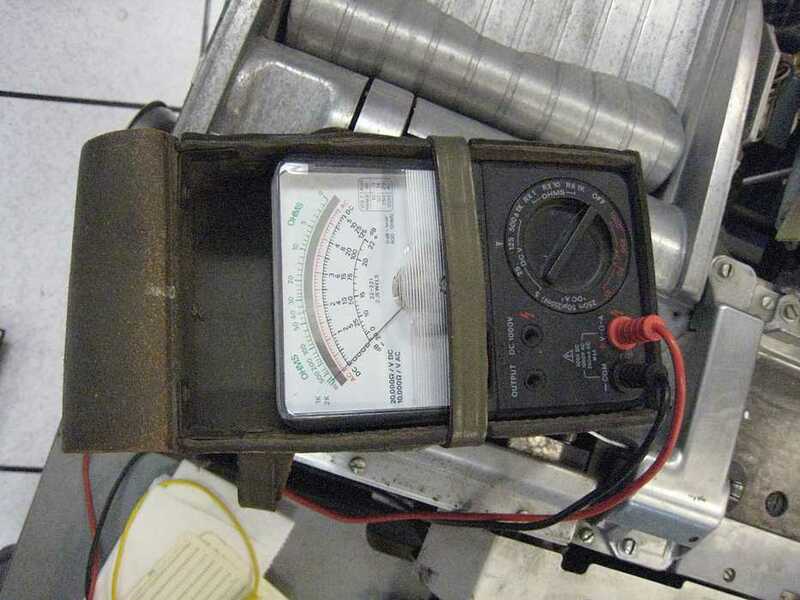 A trouble shooting document, including Margin testing (voltage, temperature, vibration, clock rate) has been added as 1401 Diagnosing Margining. Drawing of margining box is on page 2 of this document. 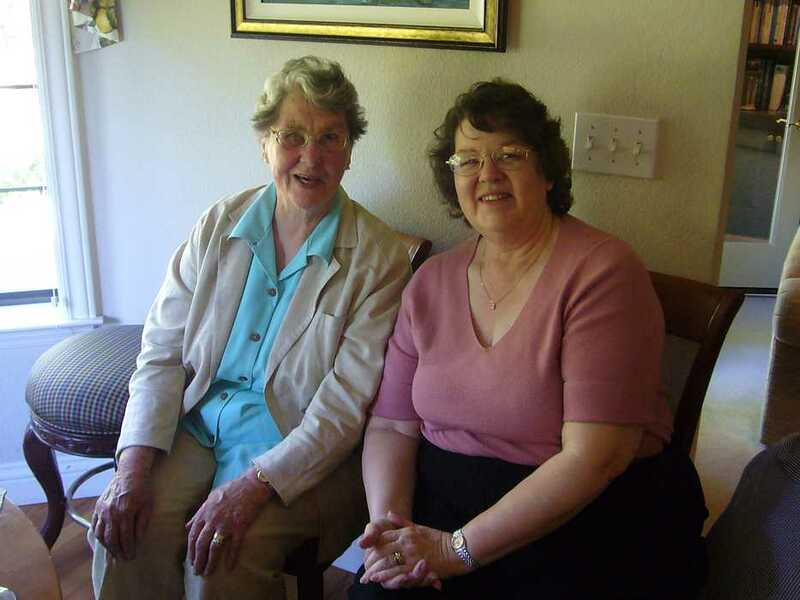 PostScript: I have written 1401, the Dark Side Addressing above 999 ". Another fun day :-)) Present were Ron Williams, Bob Erickson, Allen Palmer, Frank King, Glenn Lea, Robert Garner, Ed Thelen. 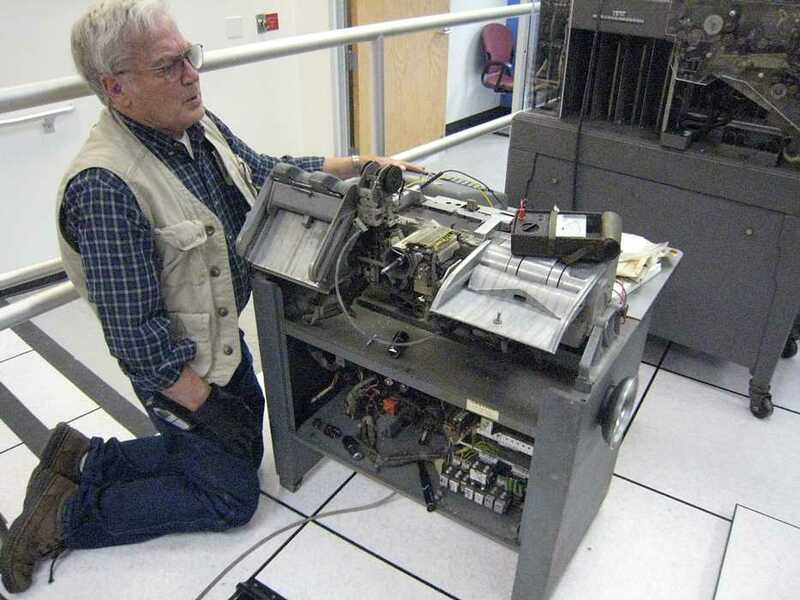 Robert Garner had his camcorder - to record audio - of the 077 collator for the Ross Perrot computer museum in Texas. Due to a large Internet gathering at the museum, we ate our bagels (thank you Robert) at a table on the north lawn. Jim Somers brought pop, chips and cookies as our normal access to these items was blocked by visitors. During lunch, Steve Purdy found another common thread with the 1401 group - ocean and lake sailing. I had not know that so many of our IBM crew had previously had sail boats, had cousins with sail boats, crewed sail boats, dreamed of sailing the inland passage along the southeast coast, ... .
Frank King decided to work on the "new" 026 key punch Robert Garner bought - from Chicago -. Museum staff (except for Jim Somers, Allison Akbay, Dave Dial) hardly ever visits us - and only then for serious purpose. Sometimes we get a "them vs. us" feeling. I heard a staff member say that there must be a lot of rough language in the 1401 room since we are working with machinery. I thought a bit - then decided that there is very little to none at all. 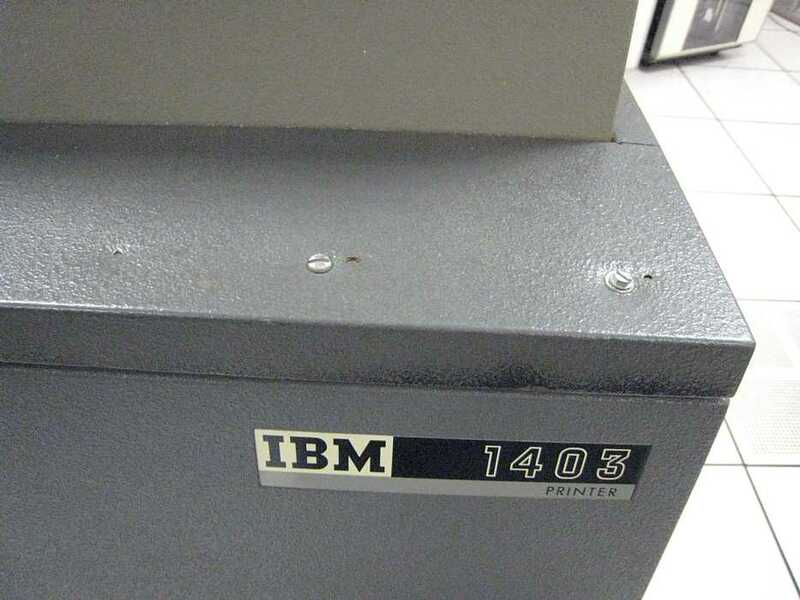 I asked the IBM guys about that. They said that cursing or foul language (especially in front of a customer!!) was grounds for instant dismissal, right up through vice-presidents. This was a business, and a family oriented company. Here are detailed pictures of the cosmetics of our wonderful 1403 printer. Some time the museum should decide what if anything should be done for some of the obvious external wear. 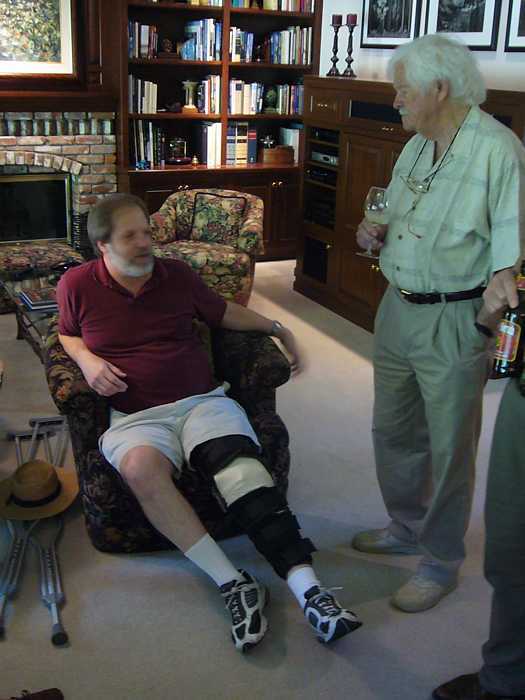 Jm Somers had forwarded Jay McCauley's proposed Seymour Cray and the Supercomputer short tour. There was detailed discussion of scheduling, what tours/presentation can/should start/conclude when - the orderly flow of people and ideas during open hours seems "interesting"
Jim Somers had invited me as "Ed Thelen is planning to join us to get some feedback/input on 1401 demonstrations." - availability of Dan McInnis "Diagnostic Availability Program and a likely successor which would be a switch selectable demo program. Is this a good length for a 1401 demo? On stream as a regularly scheduled event/part of tour? There was much talk about length - the docents seem to prefer presentations about 15 minutes in length, followed by up to 15 minutes questions. Bill Worthington has prepared a (15 minute) punched card and unit record short tour/presentation, and would like to verbalize how unit record equipment does a pay roll or billing operation. (The data operations and data flow is much more visible and obvious than the same thing in a black box 1401. This presentation, just before a 1401 presentation, should be very informative and illuminating for visitors.) 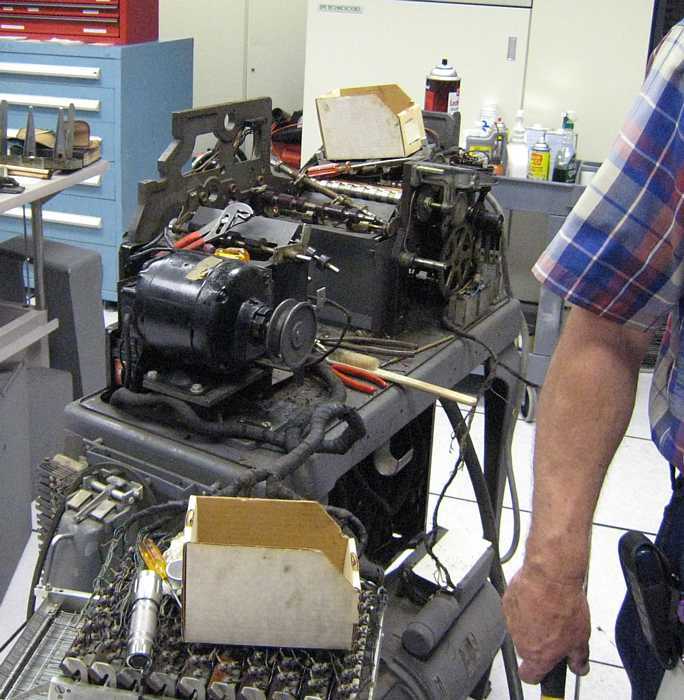 Bill would welcome a working key punch and sorter as part of his presentation. There was considerable talk about the fragility of an 026 keypunch in the hands of unfamiliar people - in the sense of high confusion and ease of making a serious (show stopping) card jam. (The correct operation of the "FEED", "REGISTER" and "RELEASE" keys takes some familiarization.) There was a suggestion of leaving the 026 in "AutoFeed" mode - and allow the user to try a correction by pressing the "Release" key only. Someone suggested a good workaround for the UPPERCASE limitation of the 1403 to express lower case parts of URLs. Should there be a separate keypunch demo/event where people have time to punch their name into a card which can by utilized in the BigPrint (Banner) program. The card can be a good "take home" souvenir. I have written 1401, the Dark Side Addressing above 999 ". I have ordered 4 25L6 s from e-bay for the key punches. They arrived today !!! We should make an instruction sheet for running the above. 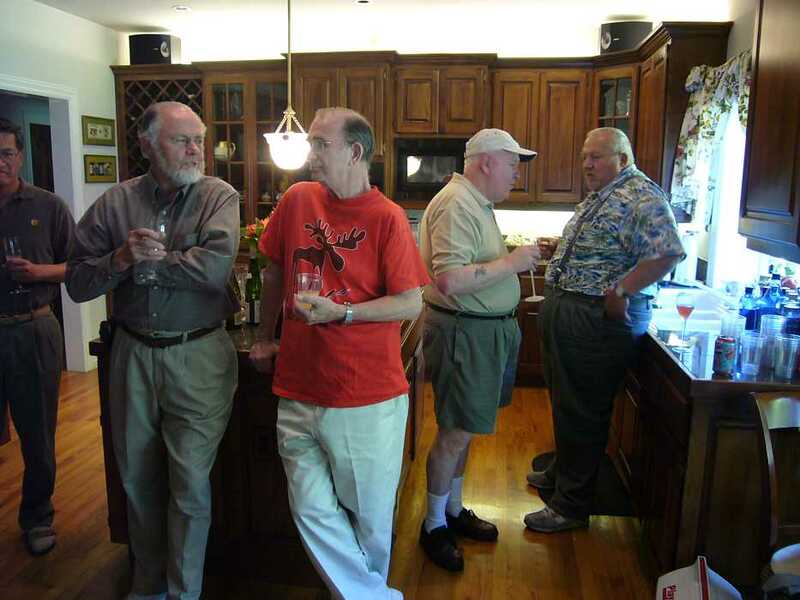 Present were: Ron Williams, Bob Erickson, Frank King, Allen Palmer, Joe Preston. Robert Garner was there with bagels and a visitor from Russia. Ron Crane brought a friend to view the action. 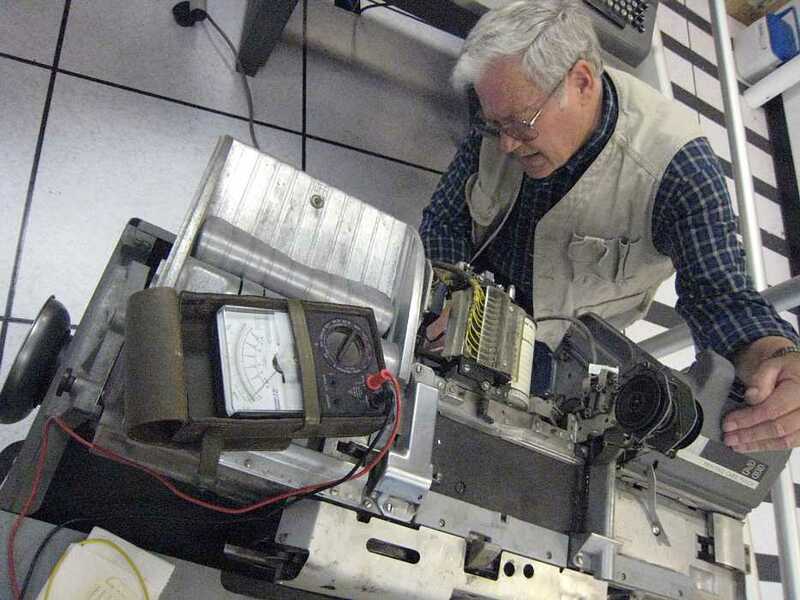 Ron Williams continues to look for missing-wires/mis-wired 1406 upper memory. (Programmed accessing of upper memory from lower memory causes next instruction to be destroyed !!) Not much progress, at least didn't go backward. Robert Garner will look on the ALDs (schematics) from Australia to see if the changes are more clear there. "Ron is looking for ALD pages 42.67.01 and .02 . I didn't find either in the Australian 1401 ALDs. (That John Deans graciously copied for us.) Apparently an EC may not have been implemented in our 1406, which we believe is contained in these pages." Joe Preston continued working on the "new" 026 key punch. Bob Erickson, Frank King, and Joe Preston worked on the 513 summary punch. One pin that secures a worn gear seems swaged in - the can't drive it out. Next time Bob will remove a casting so the whole assembly can be brought to a press for action. 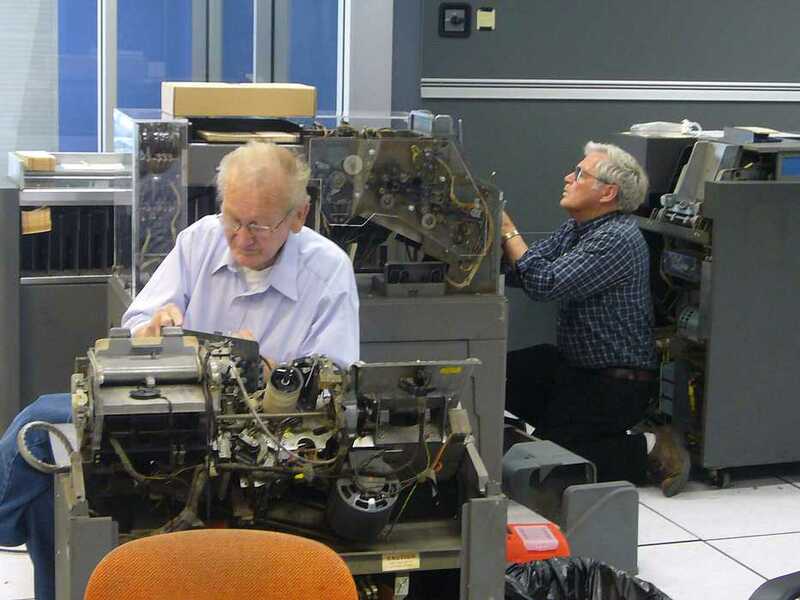 Allen Palmer continued re-assembling the tape drives. Ron Williams told Allen that a card copy to tape, and read back the tape to compare program no longer works. Ron says that Allen said it is a software bug ;-)) Ed Thelen had promised Allen that some tiny spade lugs would be present today. Will Ed Thelen have to lick the dust off the floor in penance???? I think we have a "Diagnostic Tape" in the boxes at the bottom of the tape rack. Does anyone know who can duplicate fragile 7-track tapes? Al Kossow does it regularly for the museum. Have him make an archive copy ... and then give you a duplicate of that copy. I don't think that our decks are the best starting point. The loader that precedes each diagnostic will only work with the deck being read by the card reader. (Each boot card executes a 1001 to load the next card.) It seems that the diagnostics that we have originally existed in card deck form and these decks were written to tape. 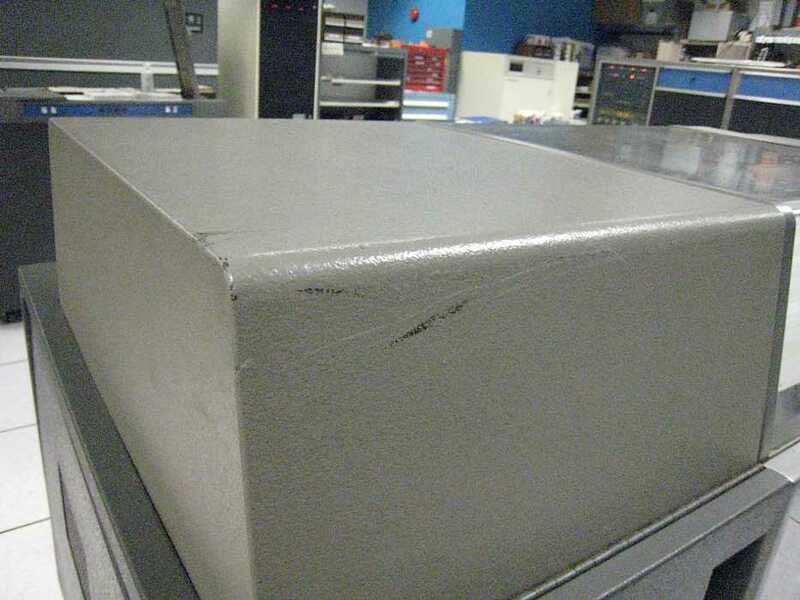 They can not load and run from tape without modification. That's why I suggested starting with a real diagnostic tape rather than the current files that seem to be card decks that were saved to tape. There was a standard IBM tape diagnostic program to create the Diagnostic Tape from the card decks that came with each tape system. I can't remember the number but dol remember thaat no modification of the Diagnostic card decks was required. This allowed the creation of custom Diag tapes with only the sections needed for a specific system. According to the diagnostics manual, program 5300 writes a test tape, program 5310 reads one, and program 5320 copies one. 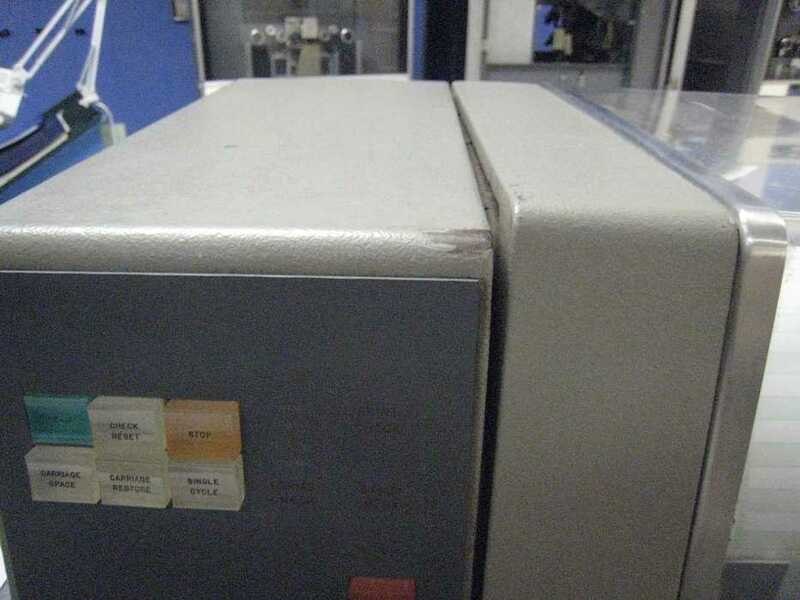 The description of 5300 says it "transfers Read and Copy Test Tape Routines and Test Programs from cards to Tape Drive 6, rewinds tape and stops. The description of 5310 says it "executes all test programs from Tape Drive 1. Programs 1050, 1060, 1070, 1080, 3500, 3600, 9000 and 9999 can only be	run from cards. I can't find the description of how to set up 5300, 5310 and 5320 in the diagnostic manual. I'll take a look at the programs and report what I	learn. I've looked at how the tape write routine, 5300, works. It sets a group mark at 1398. Take a look at the last card of a typical program other than 5300, such as 2000. Column 19 bas B031T98" where " is GM. 31 says L046352, then BW04. W04 is the place in 5300 where core is written to tape. So I think to write a bunch of programs to tape, just slap them behind 5300, mount a tape on 6 and push load. OOPS, the documentation says 5300 writes tape 6, but the code says it writes tape 1. I haven't analyzed 5300 completely, so I could be wrong. Look for documentation on 5300. The "Read Test Tape" routine, 5310, puts a tape loader at S88, so that's why the last card of 2000 replaces the "read next program" part of itself with BS88. 5310 compares S73-S76 with 73-76 of the program it just read. If switch F is off and the compare is unequal it runs the program. If switch F is on and the compare is equal it runs the program. So you can run all the tests by turning off switch F and putting blanks in S73-S76, or run one test by turning switch F on and putting its number in S73-S76. I've analyzed 5300 and 5310. 5300 writes the diagnostics on tape. 5310 is the loader that goes on the tape. To put diagnostics on tape, put 5300 *and then* 5310 ahead of the diagnostics you want to put on tape 1. If you run this with switch G off it will write a tape mark and rewind tape 1 when it runs out of cards. With switch G on, it just hangs on a read instruction so you can put more cards in the hopper. Both the programs and their detail cards go on the tape, so (except for the programs that have to run from cards) you can run diagnostics without the 1402 being in working order. When you boot from the diagnostics tape it will halt with 1369 in A and I registers so you can set codes in core, as explained for each program in the diagnostics manual, and if you like you can put a program number in 1273-1276. If you run with switch F off it runs every program except that one (so put blanks there to run them all). With switch F on, it runs only that one. I've attached three files: Two are disassemblies and reverse engineerings of 5300 and 5310. One explains how they work together. 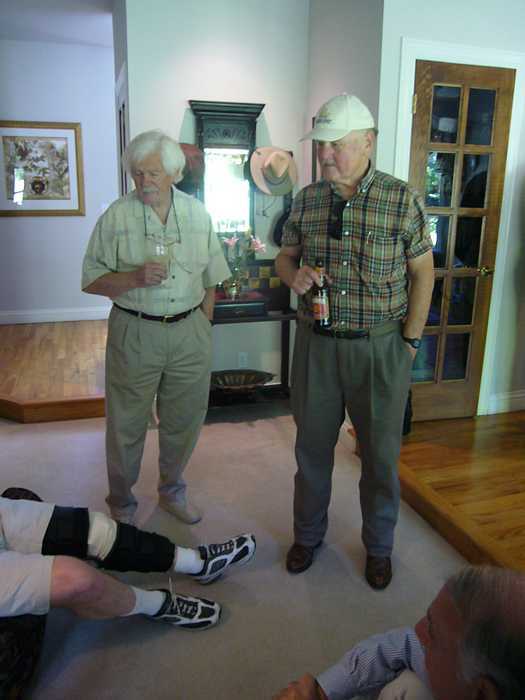 Present were Ron Williams, Bob Erickson, Frank King, Tim Coslet, Bill Flora, Dan McInnis, Ed Thelen. Dan McInnis started working with the 13 card object that Ed Thelen had key punched of Dan's "Demo Assurance Program" program. 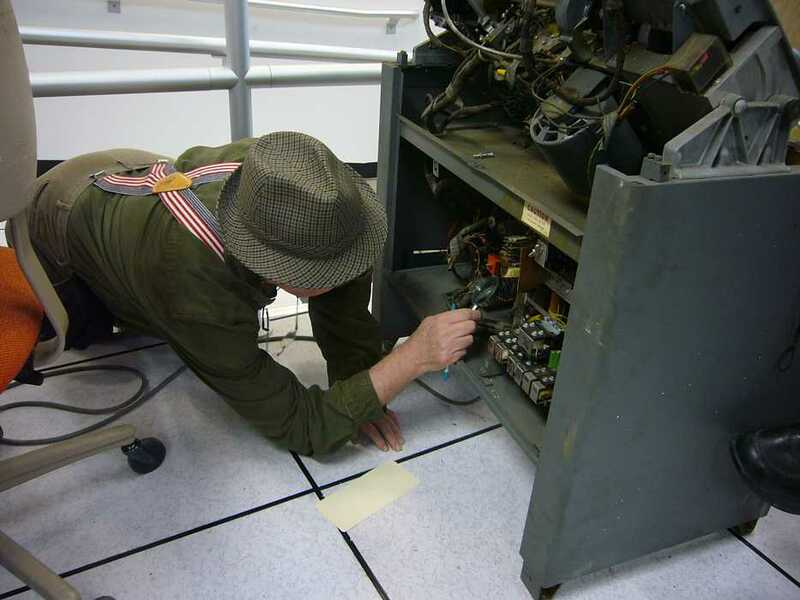 Dan got his program working except for the magnetic tape commands, the 729 would not do a load tape operation. Dan will adapt his program to have switch selections to show off the various parts of the 1401 system. 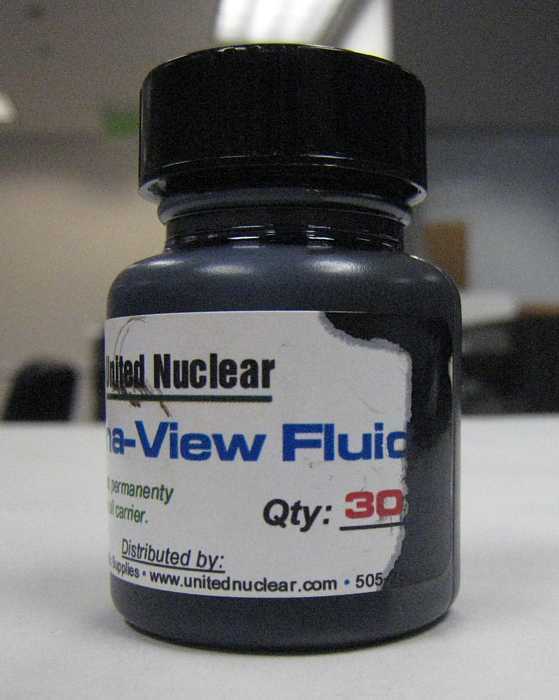 But to our surprise, it looked like black ink, and has the consistency of thin black paint. 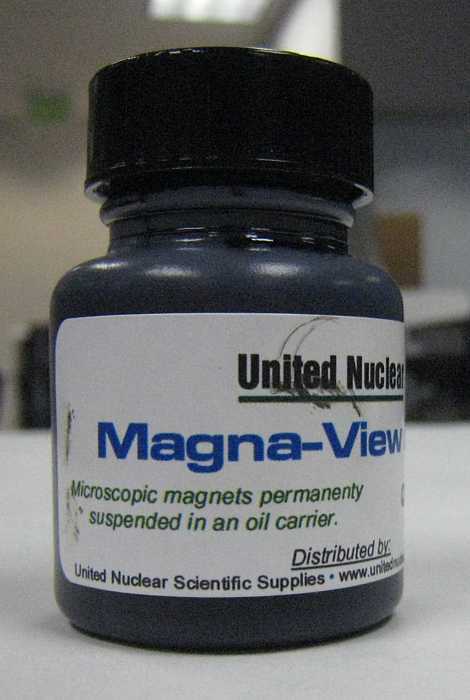 By getting the light to reflect just right, you *can* see where the iron oxide magnetite has concentrated at magnetic flips - but it is not easy, and is very messy. Tim got these pictures, I couldn't do as well - I tried flushing the excess with WD-40, but that did not work out well enough to be worth it. 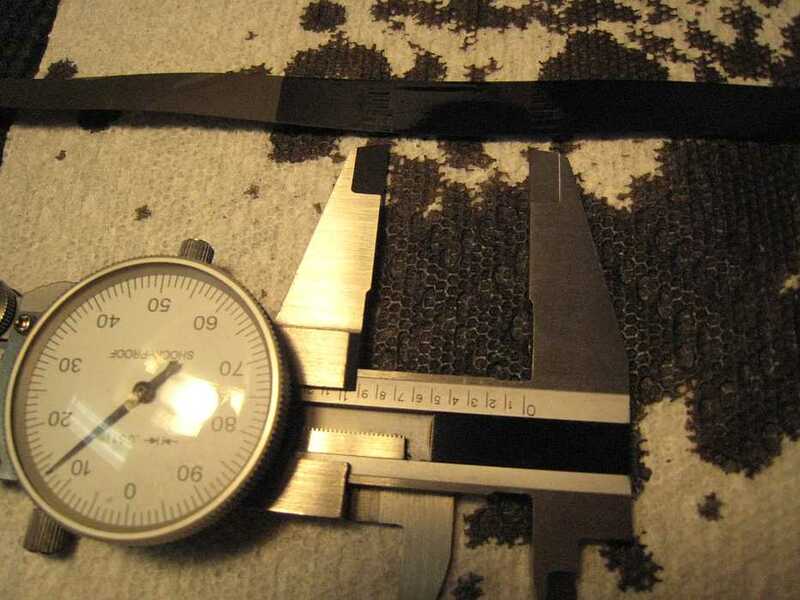 Tim Coslet was able to get measurements - Inter-record gap = 0.913 inches. Nominal is 0.75, but a little to long is not serious - just little less efficient. Trailing edge of leader foil to data is 1.42 inches - likely short of nominal - but again not a likely problem. Dust settled in the oil during the lunch hour, and puckered up into this mess. The IBM guys had a variety of memories of viewing magnetic patterns on magnetic tapes. 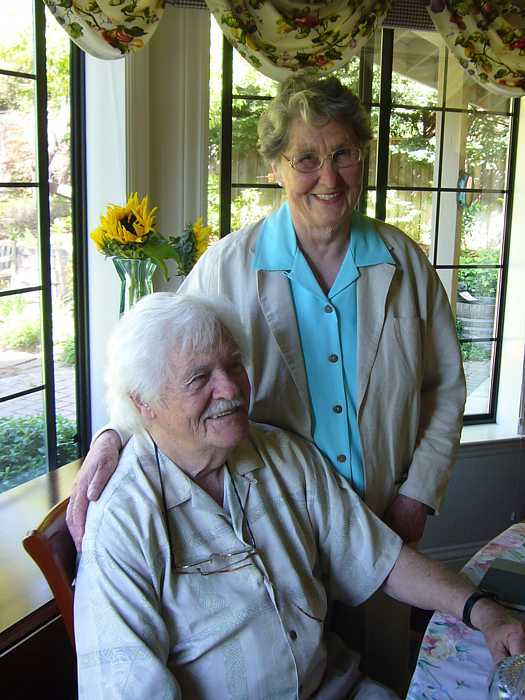 and solutions - and solutions - Frank King remembers iron particles in carbon tet. 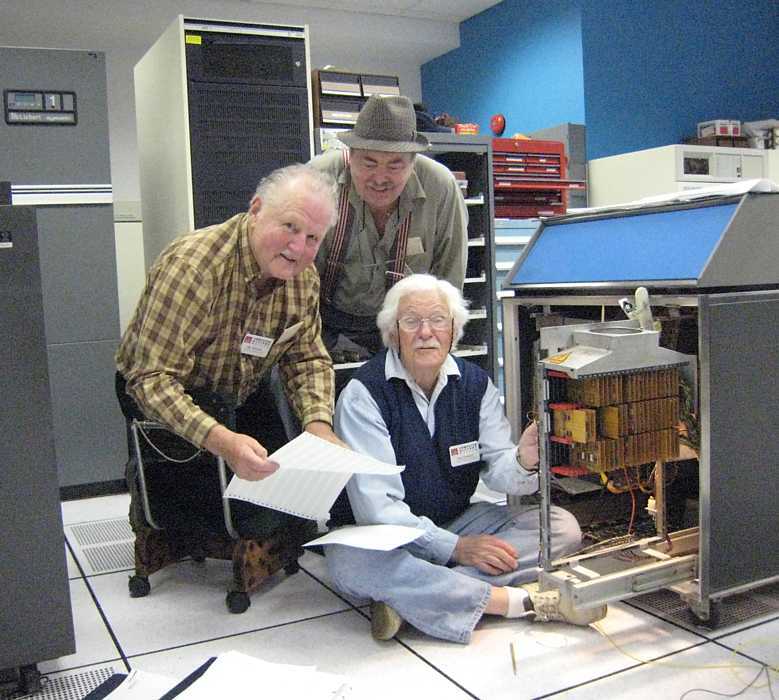 Ron W and Bill Flora remembers a spray on can of gray particles - and others - all remembered silver material coating magnetic edges on a field of the tape's red oxide. I remembered silver gray particles suspended in ?carbon tet?. Slosh the tape into the fluid through the wide mouth can, and when you pulled it out you had silver/gray on the magnetic boundaries, and the tape's red oxide elsewhere - data patterns plain as day - no squinting for reflections of lumps of black on black. 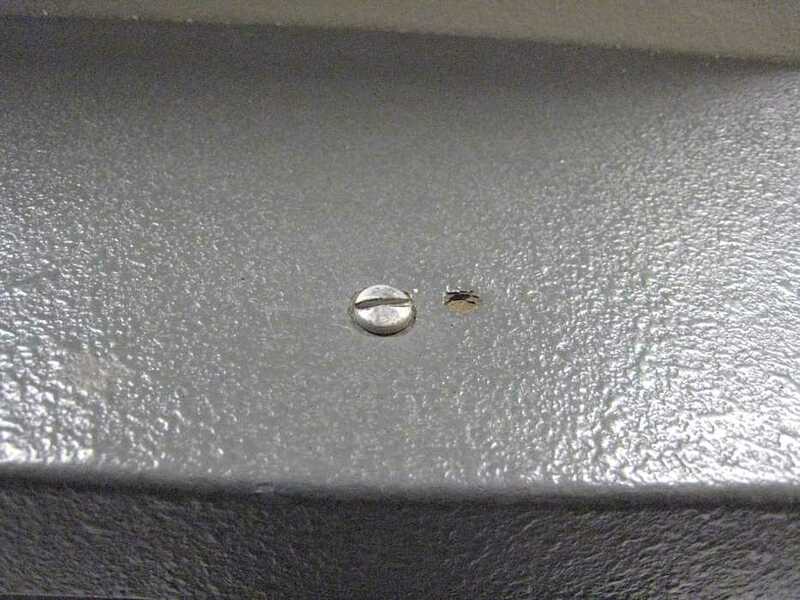 We all thought that a very thin volatile fluid is good in that the surplus drains/evaporates quickly. 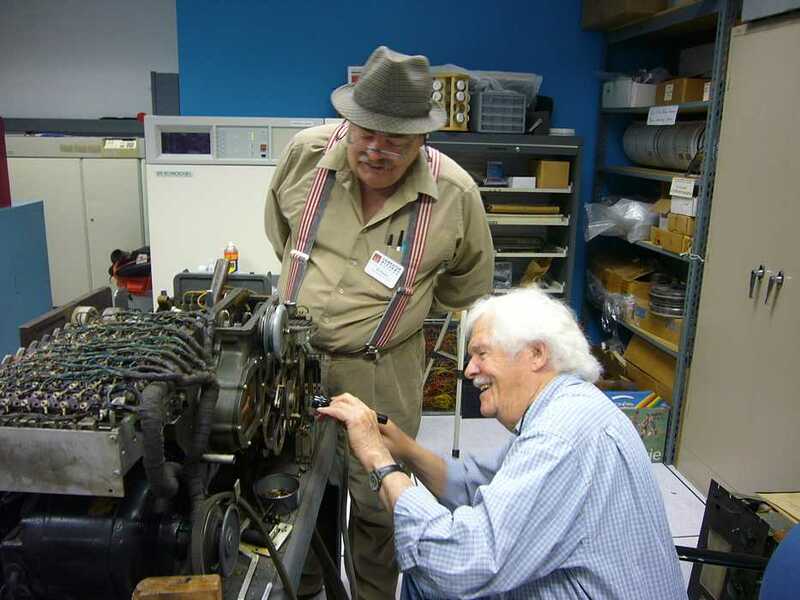 Bob Erickson and Frank King struggled with a stuck pin connecting a gear to a shaft. I have no comment - other than being fascinated with the hammers. This is not working !! - Two days to gather up and drive up to Portland. Also pick up a pre-negotiated fork-lift to get the heavy equipment from the low back yard basement up and into the truck. - Two days to un-bury and move the selected items onto the truck, and clean up the basement so that it doesn't look as though a tornado went through. - 1.5 days to drive back and 0.5 day to unload. 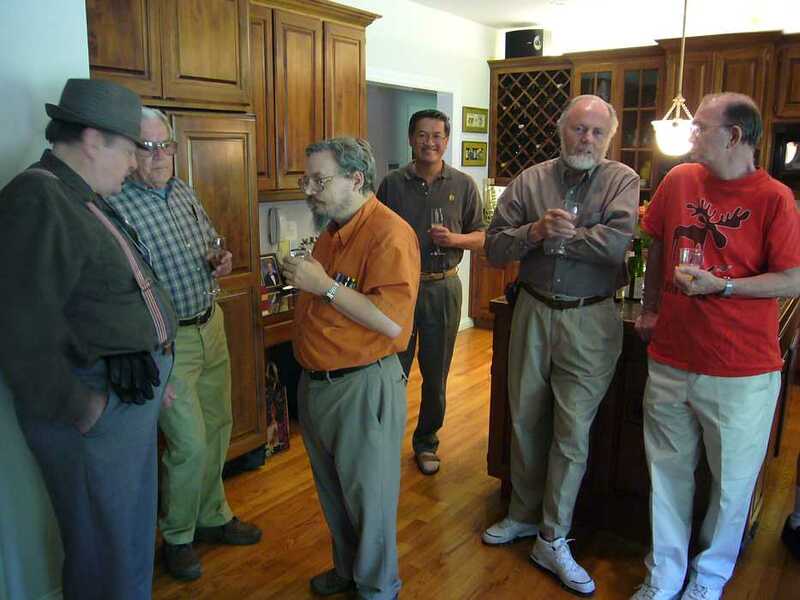 Present were Ron Williams, Bob Erickson, Frank King, Allen Palmer, Joe Prescot, Robert Garner, Ed Thelen. The tape drive did not work last Saturday. Apparently the right hand switch (which verifies that the capstan motor has extended the capstan into the tape path) was marginally adjusted did not function properly. Later Allen worked on a faulty read of C Channel. 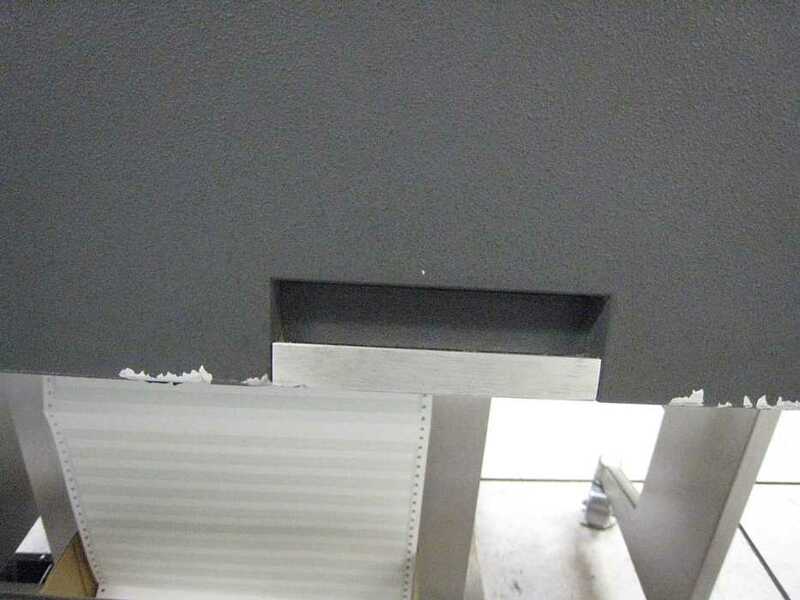 We verified that the C Channel was being written by using a solution of rubbing alcohol and fine magnetic powder from the magnetic clutches in the 729 tape units. 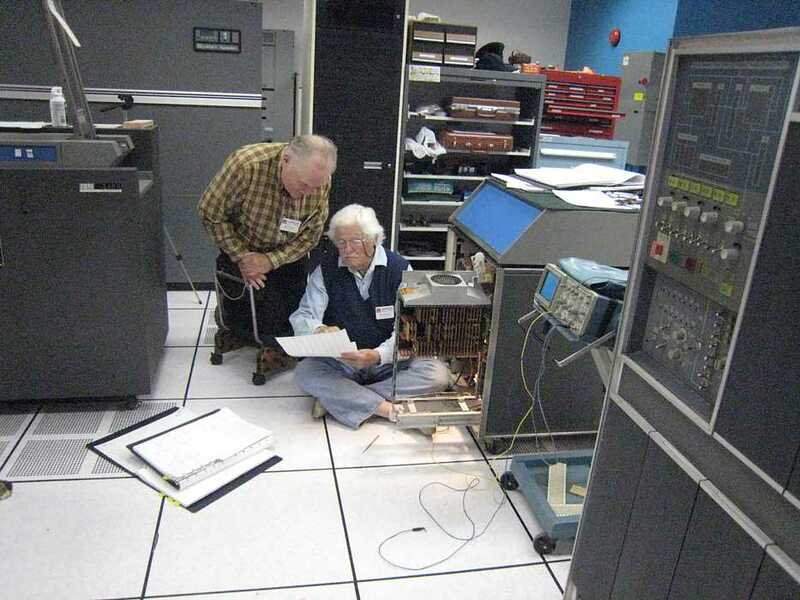 Bob Erickson (on the floor) tracing undocumented changes (red wires) in the 1406 Extended Memory Unit got lots of moral support. Someone had previously taken some windings off a relay on the new keypunch, and broken a plastic restraint. Here Frank and friends are applying epoxy (the gray stuff) to stabilize the loose windings, and will apply a jury rigged plastic restraint. 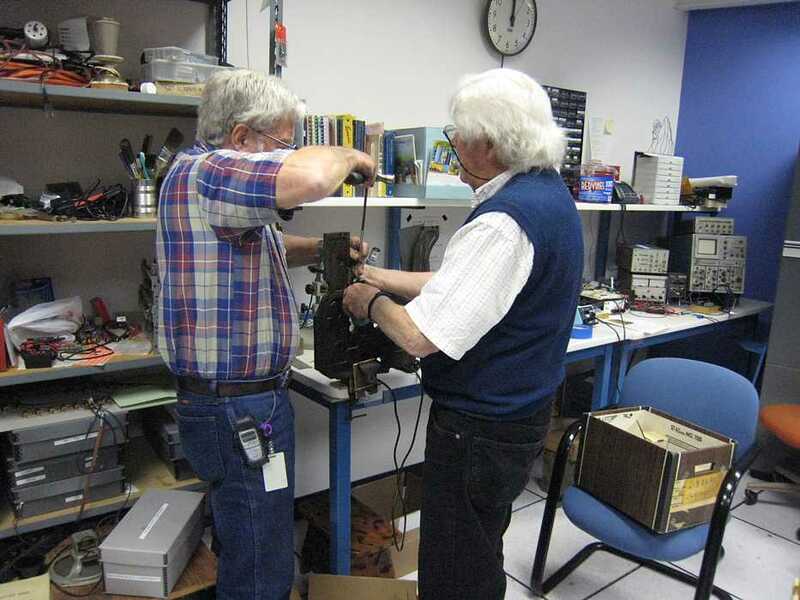 Frank and Joe found that the hold coil of a two coil relay had had failed - the identical problem we had found in Selam's keypunch. I have secured a socket and seven watt night light - Joe and Frank will do the identical fix as here. Ron shows a spikey pulse in the 1401 where no pulse should be. Apparently some signal is slow, and an unwanted pulse is generated. The picture shows that the spike is actually a double pulse with a total length of about 1 microsecond.